Run TO your problems; not FROM your problems. If you have a problem, get ready for a collision course. If you don’t, your problem will catch up to you one day. Rest assured that if you do not deal with your problem now, it will be a bigger problem when you get older. It’s going to be a tougher and meaner opponent. When dark clouds are hovering above you, remember that it will pass. It’s only a matter of time before the sun shines again. All you have to do is persevere. Tough times make us tough! 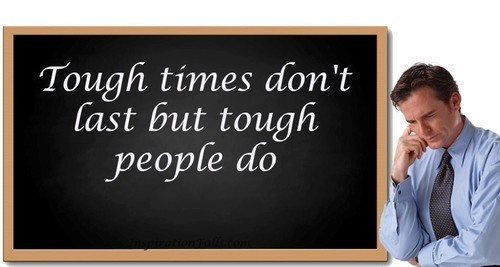 Tough times don’t last but tough people do!